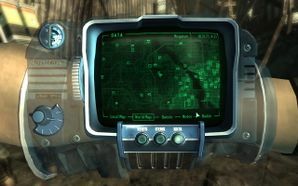 This is the much improved version of the acclaimed Pipboy 3000, with many improved features. The holographic model is favored by high-level heroes for its flashing lights and pretty colors light weight and hero-friendly design. This device uses a highly sophisticated voice recognition interface with a neural response coordination relay system. Unfortunately, this means that most of the features don't get much use by the average hero, who can't spell most of those words anyway. It has, however, been found to be extremely useful when flailing around in a panic, as it occasionally comes into direct contact with an attacker's head, and rendering them senseless. This allows the hero to use the built-in map to make a hasty exit while the opponent is out cold. For the hero's convenience, all taverns and pubs in the vicinity are shown on screen by default. Other less useful locations such as doctors, towns, temples and guild hall locations are also available if really needed.